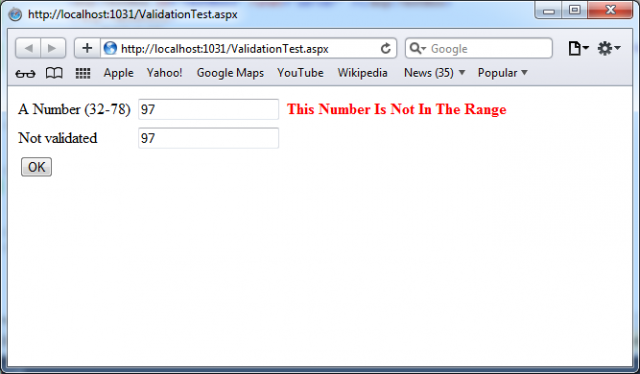 If you want to understand how RangeValidator works, by example, you can develop a simple test web page. This page uses a single Button web control, two TextBox controls and a RangeValidator control that validates the first text box. If validation fails, the RangeValidator control displays an error message, so you should place this control immediately next to the TextBox it’s validating. The second text box does not use any validation. The next picture shows the appearance of the page after a failed validation attempt. The markup for this page defines a RangeValidator control, sets the error message, identifies the control that will be validated, and requires an integer from 32 to 78. These properties are set in the .aspx file, but they could also be configured in the event handler for the Page.Load event. The Button automatically has its CauseValidation property set to true, because this is the default. An additional Label control is used to report when the page has been posted back and the event handling code has executed. Its EnableViewState property is disabled to ensure that it will be cleared every time the page is posted back. In case if you want to see what will happen on a browser which does not support client-side validation (i.e. down-level browser), you should set the RangeValidator.EnableClientScript property to false, and rerun the page. Now error messages won’t appear dynamically as you change focus. However, when you click the OK button, the page will be returned from the server with the appropriate error message displayed next to the invalid control. // Abort the event if the control isn’t valid. // Abort the event if any control on the page is invalid.